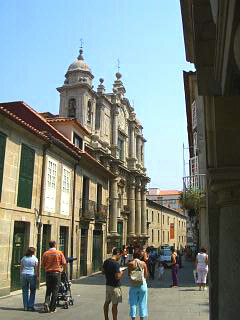 The (church) "Igrexa de San Bartolomeu" is in the same locality as the main museum buildings and the quaint Praza de Lena (square) to the eastern end of Pontevedra's old quarter. It has a stunning frontal facade, but one that is unfortunately difficult to see in its entirety due to the proximity of the opposing buildings on the narrow street it occupies. This can clearly be seen in the photo to the left which shows the terracing of the church with the adjoining structures. To make matters worse, we also noticed that a new multi story structure was being constructed within metres of the churches rear facade, obscuring it completely! The "Igrexa de San Bartolomeu" has plenty of history associated with it and was owned and worshiped in by the "Jesuits" between the years of 1650 and 1767. In 1767 the "Jesuits" were evicted from not just the church, but the whole of Spain, and "San Bartolomeu" became a parish church in the following century. 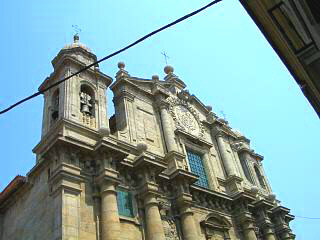 Designed and built in the Baroque style of the Jesuits, it was acknowledged as a classic work of its kind by the seventeenth century and is now viewed as a prime example of Galician Baroque. The main features of its design are six towering columns, three either side of the recessed entrance, that support an ornamental soffit above which a central pitched window enclosing wall and two small bell towers are perched. See the photo to the right. Inside the church there are several notable features. Statues of "Our lady of hope", an eighteenth century carving of the "Madonna" along with seventeenth and eighteenth century statues of various saints. The alters are also highly regarded. Two other buildings of interest lay just metres away from the church of saint Bartolomeu. 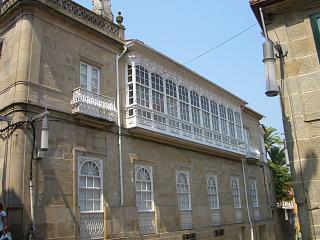 One, the "Edificio Saramiento", is now part of Pontevedra's museum complex, but was lived and worked in by "Father Isla", a well known priest. It is directly opposite the church. A second building, this time with a stunning Galician "galeria" (or enclosed balcony) is on the same side of the street, but slightly further away. Back to the Pontevedra Galicia home page.